It is an apt name for the Columbia River anadromous fish restoration plan of the Nez Perce, Umatilla, Warm Springs, and Yakama tribes. The plan’s vision is to put fish back in the rivers and protect the watersheds where fish live. The plan was created in response to the precipitous decline of salmon in the Columbia River Basin from their estimated pre-contact numbers of 15-20 million fish annually to fewer than 500,000 in the late 1970s. Columbia River Basin Salmon Extirpation Map from 1890-2011. Wy-Kan-Ush-Mi Wa-Kish-Wit provides a framework for restoring anadromous (or sea-going) fish stocks, specifically salmon, Pacific lamprey, and white sturgeon in upriver areas above Bonneville Dam. The plan’s geographic scope extends wherever these fish migrate and throughout the Columbia River Basin wherever activities occur that directly affect them. The plan is organized into two parts. The first volume sets out technical and institutional recommendations for action. The second volume contains subbasin-by-subbasin goals and the watershed restoration actions that must be undertaken to achieve them. The technical recommendations of Volume 1 are presented in 13 scientific hypotheses that summarize restoration problems. Organized by salmon lifecycle stages, each hypothesis proposes near- and long-term actions, identifies expected results, and names the institutional and decisional processes required to carry out the recommended actions. In the second volume, subbasin plans are provided for 20 major watersheds above Bonneville Dam and for three mainstem Columbia and Snake river areas. Emphasize strategies that rely on natural production and healthy river systems to achieve this goal. Protect tribal sovereignty and treaty rights. Reclaim the anadromous fish resource and the environment on which it depends for future generations. Within seven years, halt the declining trends in salmon, sturgeon, and lamprey populations originating upstream of Bonneville Dam. Within 25 years, increase the total adult salmon returns above Bonneville Dam to 4 million annually and in a manner that sustains natural production to support tribal commercial as well as ceremonial and subsistence harvests. Within 25 years, increase sturgeon and lamprey populations to naturally sustainable levels that also support tribal harvest opportunities. Restore anadromous fishes to historical abundance in perpetuity. 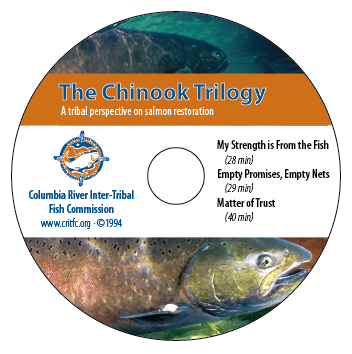 Click here to learn about and watch a three-part series on the importance of salmon to the tribes and how they can be restored by applying the principles described in Wy-Kan-Ush-Mi Wa-Kish-Wit. Wy-Kan-Ush-Mi Wa-Kish-Wit was updated in 2013. The complete update, along with the original two volumes, is now available at plan.critfc.org.